Recently, Diane and I had some friends over for dinner. This isn’t an unusual event for us: We both like to cook, and we like to share our best wines with people who’ll enjoy and appreciate them. Also, truth to tell, we don’t enjoy restaurant dining very much anymore. That’s for a number of reasons. The chief one is noise: The number of restaurants where it’s impossible to have a civilized conversation over dinner increases every year, and conversation is one of the pleasures of a good meal. Diane and I have simply stopped going to several places whose food we like very much, because we had to lean across the table and shout in each other’s face to be heard. Prices, of course, are another factor: The number of restaurants where the cost of dinner for two represents a respectable fraction of one’s weekly income has also increased dramatically – especially if one likes wine, since restaurants continue their unenlightened policy of rack-rent mark-ups on wines. The third major reason is the food itself: In many places, you can’t get a dish that tastes of a recognizable ingredient because there are so many of them, subjected to so much chef’s-fantasy tweaking. More and more, we find ourselves appreciating the classic French cuisine bourgeoise (which you can hardly find anywhere) and the Italian ideal of excellent prima materia treated respectfully and allowed to taste of itself. So we shop carefully and cook simply – and often, since eating is a pleasure we like to indulge on a regular basis. I read somewhere that it’s good for you. Almost all the dishes could be prepared before guests arrived and only needed to be warmed, leaving us both free to enjoy our company. As it turned out, we didn’t use the Mastro Fiano: Everyone was content to continue with the Champagne through the light, palate-refreshing antipasto salad. The marriage of the cannelloni (recipe from our first cookbook, La Tavola Italiana) and the Furore was truly made in heaven; since both the dish and the wine originate in seaside Campania, they can be said to have been childhood sweethearts who grew up together. The Marisa Cuomo estate deserves to be much better known: the quality of its wines is always excellent, and the Furore – a blend of Aglianico and Piedirosso – is particularly fine. The main course lamb Diane has described on her own blog, so I’ll content myself with saying that it was rich and succulent. The pairing of almost any lamb dish with almost any Cabernet-based wine is a no-brainer, and the Talbot – that rarity in Bordeaux, a still-moderately-priced classified growth – performed admirably both with the meat and the subsequent cheese course. It also followed very nicely on the elegance and understated power of the Furore. Neither of these was an in-your-face wine: they were chosen for restraint and complexity and a willingness to play well with others. In my opinion, nothing destroys the harmony of a meal more thoroughly than a sandbox bully of a wine, a big fruit bomb that won’t let you taste anything but itself. No danger of that with either Furore or Talbot. 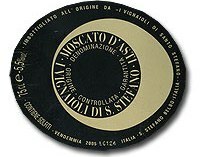 From that complexity we came down lightly, with a not-very-sweet but richly chocolaty cake and a dab of ice cream, accompanied by the gentlest of dessert wines, a Moscato d’Asti from Ceretto, a Piedmont master – a kiss-on-the-cheek of a wine, the perfect finish for a comfortable dinner. Next morning, finishing the clean-up (it was a two-dishwasher-load dinner), we amused ourselves by trying to calculate what such a meal would have cost us in a restaurant, (if we could get it), but gave up in despair of the convolute math calculations involved. Suffice it to say that the whole evening was why we cook in the first place, and why we buy young wines and store them, even if our “cellar” is far from ideal. If you love the sensations provided by mature wines, it’s the only sensible course of action. Unless of course you have unlimited wealth – in which case you don’t need a cellar, or even a kitchen: you can buy your meal, and maybe even the quiet to enjoy it in. Tasting new releases, as anyone in the wine business knows, is a rarely a pleasure – more of a necessary evil. Especially in these days of intense market pressure, most new releases aren’t ready to drink, and the best of them – wines of texture and complexity – may be years or even decades from their peaks. But science is a cruel mistress, and to keep abreast of the flow, to have an empirical base from which to make judgments and reasonable predictions, a writer has to taste a lot of young wines – many hundreds of them, every season. That’s why it’s crucially important to drink mature wines at every available opportunity, to remind yourself of what this whole process is all about. It sure isn’t about discriminating between an 88.5 and an 89 point infant Cabernet, whatever the blurbsters may lead one to think: It’s about sipping nectar and being transported, not spitting raw grape juice until they carry you out. So my cunning plan (as Black Adder used to say) for avoiding that fate consists partially of trotting out to Brooklyn for dinner at Tommaso’s, which is one of the few places in New York where I can afford to order older wines. 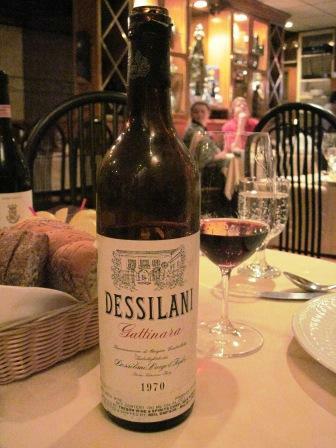 (During a recent visit for his seasonal-special white truffle dinner, Diane and I drank his last bottle of Dessilani’s lovely 1970 Gattinara, a dream of silk and subtlety.) But mostly it consists of raiding my own oldest stock and serving selected bottles to friends who appreciate them as much as I do, partnered with the fine dinners orchestrated by my partner Diane. This fall, we did two such morale-and-palate-saving evenings, extravaganzas approaching caloric megadeath (you can always eat salad tomorrow, or all next week if it comes to that). The food was wonderful, and the wines played up to the dishes. For the first dinner, Diane prepared a Piemontese feast for four friends – Charles and Michele, Ernie and Louise – who were about to visit that white-truffle-blest paradise. We didn’t have any truffles, but we tried to give them dishes that would ring true to what lay in store in Italy. I pulled out of my “cellar” (euphemism or metaphor at best) Deutz Champagne brut nv, 1989 Prunotto Barbaresco Montestefano, 1989 Vietti Barolo Lazzarito, 1982 Ceretto Barbaresco Bricco Asili, and Santo Stefano Moscato d’Asti nv. 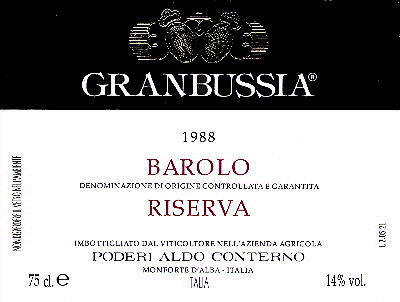 Ernie, bless his soul, provided a 1990 Aldo Conterno Barolo Gran Bussia and a 1958 Giacomo Conterno Barolo Monfortino. All the wines were in excellent condition – not a cork problem or bad bottle in the lot – and each showed the elegant depth and heft and complexity that uniquely belongs to mature Nebbiolo of fine vintages. We didn’t drink them in order of age but as I felt their body and power and relative vigor or fragility matched with the food. The Champagne accompanied some light hors d’oeuvre (toasted hazelnuts, some salume) and continued with an antipasto of fennel spears wrapped with prosciutto and roasted. Tagliarini with a sauce of wild mushrooms and veal called for first the 1990 Gran Bussia, then the lovely ‘58 Monfortino, both of which provided the elegance and restraint that sauce wanted. The two ‘89s, both big-bodied and vigorous wines, and the 1982 Bricco Asili, fully evolved and very complex, accompanied roasted squabs stuffed with chestnut puree and afterward a plate of cheeses. Finally the light and charming Moscato, a refreshing palate-cleanser after all that impressive Nebbiolo, paired beautifully with a pear timballo topped with mascarpone cream. 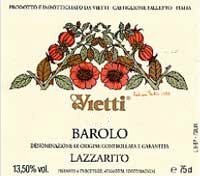 Opinions were pretty evenly divided as to whether the wine of the day was the ’89 Vietti for its concentrated power or the ’58 Conterno for its elegance, but the entire group of wines counted as champions. Truth to tell, it was really one wine too many. They were all so good that they began to interfere with each other. They gave my palate and aging brain almost too much to deal with. I think less would have been more: One fewer bottle – though which of those gems I would omit I can’t imagine – would have focused us better. A valuable lesson, that, and one I will bear in mind in the future. In fact, I did bear it in mind for our second dinner. This was less tightly regional, though largely Italian again, for four Italophile friends, Livio and Betty, and John and Vicky. Here are the wines for that dinner: Roederer Estate Brut nv; 1997 Nipozzano Chianti Rufina Riserva; 1982 Banfi Brunello di Montalcino Riserva; 1991 Serego Alighieri Amarone Vaio Armaron; Santo Stefano Moscato d’Asti nv. Unquestionably, fewer wines worked better: the matches of food and wine just sang. Once again our sparkling wine went from hors d’oeuvre through roasted prosciutto-wrapped fennel (when you find a good thing, stick with it). The characteristically Rufina earthiness of the Nipozzano played beautifully with bucatini all’amatriciana (made with la vera cosa, real Italian guanciale). The ’82 Brunello – in that vintage, this wine would have been made from Banfi’s oldest vines, the former Poggio alle Mura vineyards – showed its lively Sangiovese acidity and freshness with a pork loin roast that had been lacquered with Dijon mustard, brown sugar, and chopped pistachios. At the same time, the wine displayed its velvety Sangiovese tannins with the vegetal bite of the contorno of braised Swiss chard and mustard greens. With the cheese, that glorious Amarone gave us not an aria but the whole opera, opening different facets of its enormously complex personality with the different cheeses – Gorgonzola dolce, Chabichou, Brunet, aged Gouda. This wine demonstrated conclusively what nonsense is the belief that Amarone can’t accompany a meal. Nothing could have completed the substantial courses of this dinner better. Finally, the same lovely Moscato as in the previous dinner worked just as effectively with a featherweight pumpkin chiffon pie. Readers of my earlier rants know just how deeply I love older wines. Dinners like this are the reasons why. If anyone thinks it’s too much trouble to lay wines down and wait for them, I have only one thing to say to you: You’re wrong. It is hardly any trouble at all: the biggest difficulty is to keep your hands off them long enough for the wines to evolve. The times we live in aren’t conducive to patience. But it is worth acquiring the discipline, because the pleasures properly aged wines afford – as I’ve tried to give some inkling above – are of a wholly different order from, and light years beyond, the best that young wines can do.